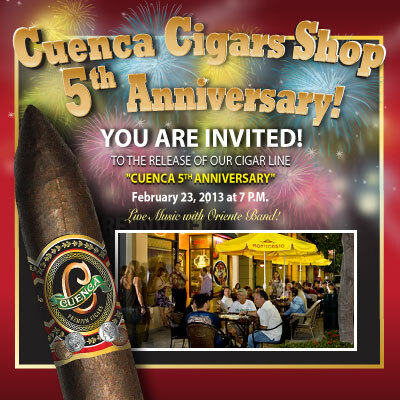 Next February 23rd, 2013, at 7 P.M, Cuenca Cigar of Hollywood will be celebrating Cuenca Cigar Shop’s 5th Anniversary and formally releasing their new cigar: **“Cuenca 5 Anniversary”. The Biggest Cigar Block Party In The World! and Entry FREE! Cuenca Cigars will host the launch party at their Hollywood, Florida location. There will be several cigar manufacturers, Mr. Peter Bobber, Mayor of the City of Hollywood, and Eddy Balzola & Oriente Band, who will be entertaining the attendees with their live Afro-Cuban jazz-blues-rhythm-n-soul music. At the beginning of January, 2013 Cuenca Cigars started to run an online survey, which will end on the event night. All participants entrees whether local or online that smoke a “Cuenca 5 Anniversary”, and complete the survey will be entered for a chance to win a prize. Every half-hour the hosts will spin the raffle ticket drum and pull out a winner. To close out such a terrific event, several larger drawings will be held. You must Smoke a "Cuenca 5 Anniversary" Cigar. You can get them online by following this link. You can buy a Box, 5 Pack or Single and it's Free Shipping for everything. If you get a Box you will received a "I am Cuenca" T-Shirt. Get Online and fill out the Cuenca 5 Anniversary Survey. Be alert on the event night. February 23, 2013 afte 7 pm. We will be drawing 5 Winners every half hour. Winners will be Blog and Post it on facebook and Twitter. Make sure you like our page and follow us o twitter to get the updates. See how to follow us below! If you can not make it to the event and still win, we will send you an email to request your address and mail the Free Gift to you! Good luck! and thanks for your feedback! This invitation is open to everyone! Come join us and let’s spend a historical night together. **“Cuenca 5 Anniversary” is a medium to full body cigar with a full flavor profile, accented with spicy notes. The cigar is a 7 x 54, Torpedo Box pressed, with carefully selected dark Habano wrapper from Nicaragua. It is aged and cured by AJ Fernandez the creator of San Lotano Cigars. They come in an elegant cedar box which contains 10 cigars. The cigar line will be expanded at the beginning of the second quarter of 2013, where we will introduce another sizes.